I have loved it since I read my first book on the subject when I was about nine years old. The stories were larger than life. I enjoyed the drama and the tragedy. 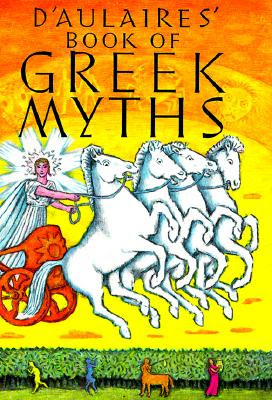 I read as many books on Greek mythology that I could find. After awhile, I recognized that even though different authors told the same stories that they weren't identical. There were variations in the details. It was then that I started cultivating my own preferences in regard to the legends. I tried reading Edith Hamilton's books, but I found them dull. She bored me, even if she is thought to be a great authority on the subject. I much preferred D'Aulaire's Book of Greek Myths. It was the first book that made me stay up late into the night reading. I was in sixth grade and read until four in the morning. I have since bought that book several times over. I have given it as gifts, and have bought replacement copies when my loaned copy never came back. The aspect that I liked best in their telling was introducing each god, goddess and hero separately with their own story. Then as you finished with one god, the narrative thread pulled you to the next story. I still love that book, and used it to introduce my own son to Greek mythology. I find the stories in Greek myths to be rich with honor, drama, hubris and pathos. Unfortunately, I have been greatly disappointed with movies trying to tackle this wealth of dramatic potential. It is as if the screenwriters and filmmakers do not know how to utilize the power of these stories and find themselves adding extraneous subplots that ruin the stories. I hated the Harry Hamlin/Ursula Andress version of Clash of the Titans. I can't remember much of the plot, but I remember shaking my head repeatedly going, "No, that's not how it went." I also remember that the special effects were clunky and only slightly better than Godzilla versus the Smog Monster. Then there was Disney's Hercules. I couldn't force myself to watch the whole thing. Hercules was somehow or another involved with Pegasus. Pegasus! Ahem. Hercules had nothing to do with Pegasus. It was Bellerophon who rode on the back of Pegasus. And then Disney had Hades shown as a comical character with minions of Pain and Panic. Are you kidding me? Give me Deimos and Phobos any day. And make them fearful characters, not comic relief. I found the story so painful I had to shut it off. Given those bad experiences of attempts to translate Greek mythology into movies, I was reluctant to wade into those waters again. I knew what I liked, and pretty much left it alone for years. 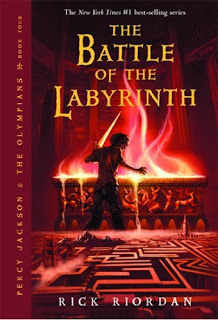 The first time I became aware of the Percy Jackson and the Olympians series was in a bookstore and saw the cover of The Battle of the Labyrinth. It was the word labyrinth which caught my attention. My friend Cindy Pavlinac loves labyrinths. Thinking of Cindy, I picked up the book and read the back cover. 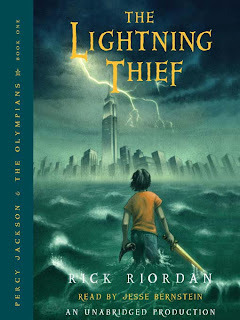 It is the fourth installment of the Percy Jackson series, which meant to understand what was going on in it I'd have to read three other books first. And, well, reading the summation that the series dealt with Greek mythology was actually a turn off for me. Because of my previous bad experiences with movie adaptations of Greek myths. I was afraid it would be handled just as poorly. I saw that book on several different occasions and I resisted buying it. It was only when I saw a listing of the awards given to the first book in the series that I decided to give it a try. I started reading the book with my son, and after about a week or so, I began reading ahead. I read all five books in quick succession. I will admit that the beginning of the first book seems a bit rushed and clunky, but once Percy Jackson is given the iconic Call to Adventure the story really takes off. Rick Riordan chose to set this series in modern day with the premise that the Greek gods are real and that they follow Western civilization. Greece is no longer the focal point of Western civilization, so Mount Olympus has moved. The home of the gods is now atop of the Empire State Building in New York City. The 600th floor to be exact. Likewise, the entrance to the Underworld has changed as well. It is under Los Angeles. After having lived in Los Angeles for a few years, I have to say that was an inspired choice. Riordan set up the idea the monsters from Greek myths were without souls, so they cannot really ever die. Instead they are archetypes that when given enough time can re-form. That allows Riordan the freedom to recycle the Biggest, Baddest Meanies of Greek myths in his stories. He uses the Minotaur, Medusa, Polyphemus and more. Riordan weaves different stories from Greek mythology together in a manner that should inspire children to want to learn more about his source material. He obviously read up on the subject and even used some lesser known figures and stories. My favorite part of his series was trying to puzzle out who different gods, goddesses, monsters and characters from the legends before they were positively identified in the text. There was once when I was reading to my son that I shouted out "Echidna!" two whole pages before she was named in the story. It made me feel like a Greek myth trivia whiz. Another aspect of enjoyment for me was how Rick Riordan saw the various gods and goddesses. Riordan and I seem to have similar affinities for the deities. I have always been drawn to Athena and her character is treated with respect and deference. Aphrodite? Not so much. Neither is Hera. Ares the God of War is shown as a punk. Apollo is cool and wears sun glasses. Poseidon dresses a lot like Jimmy Buffett. The god who surprised me the most was Riordan's treatment of Hades. I never expected him to be that funny. And, Hades was being unintentionally funny. A difficult trick to pull off. 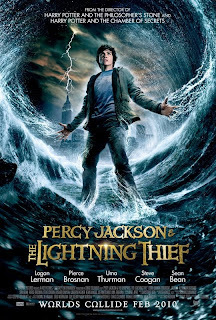 And now a movie has been made of The Lightning Thief. The previews look fabulous, even though the actors are much older than the characters from Riordan's stories. Riordan had Percy as being twelve in the first book and turning sixteen in the last volume. Logan Lerman who plays Percy Jackson was seventeen, not twelve. As a mother, I find it easier to believe that a seventeen year old could battle the Minotaur rather than a child around my son's age. So that difference does not bother me. I also know that the filmmakers might want to appeal to teenaged audiences as well, so have an older teen will probably sell more tickets. Whatever works. Just be sure to keep the humor intact as well as the action in these stories. Right now, I am looking forward to seeing the movie next weekend with my son who will be proudly wearing the handmade Camp Half-Blood t-shirt I made for him. Linda, I knew we were sisters in more than Tri Delta! You are hitting the nail on the head, although I admit with shame that I haven't read the books yet. My son Max, however, has educated me quite well about them and I feel as though I have. I want to read them before seeing the movie. I LOVE Greek mythology, as well as other mythos. I feel like they are a secret world, yet one that we have the clues from our own lives to unravel their mysteries. I thought I was alone in trying to read Edith Hamilton, then giving up because I couldn't get into her. I also have the D'Aulaire's book and both Max and my daughter Ari have loved it. Working at Baldwin Public Library in Birmingham, MI, has given me a lot of exposure to new myth books coming in for kids, and I must say that some are pretty but lacking in content. I read a brief retelling of Echo and Narcissus, and they left out the part about how that is how the narcissus flowers came to grow at the water's edge! Come on! That is a major part of the story, part of the resolution! 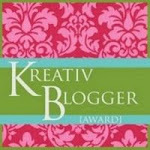 Anyway, I am subscribing to your blog now and look forward to reading more. You are an accomplished writer and an inspiration to those of us who always thought it would be cool to write about mythology, but never did. It's great to "hear" from you. I love your screen name. A few weeks ago I was in a coffee shop here and saw a man wearing a jacket with the logo "Up North Michigan." I had to talk with him. He was from Marquette. We had a nice chat while waiting for the barista to make our drinks. I agree with you on your assessment of being disgusted at leaving out the significance of the Narcissus flowers. Do they not understand the full meaning of the story? BTW, Riordan's take on Hermes is pretty much dead on for what I expected him to be like. Except for a passage or two in the fifth book, but overall I love Riordan's Hermes. You should pick up the books. They are filled with humor and a love for Greek myths. In honor of my son's love for the series I even had a bakery make a blue birthday cake for him with a trident on it. He loved it. Let me know what you think of the books as well as the movie!